Now that we have moved into Autumn, you can avoid getting Winter dry skin by preparing your skin now! 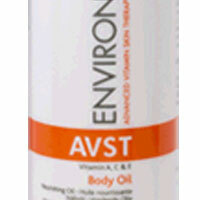 Environ AVST Vitamin A, C & E Body Oil is renowned for its moisturising effect and is used mostly on the body. It is a very fine oil, containing high doses of vitamins A, C and E. It is excellent for dry skin conditions and is particularly recommended for sun damaged areas of the body. It promotes the production of healthy Collagen and Elastin and improves the blood supply to the layers of the skin, increasing the growth of the basal layer of the skin, thereby thickening the epidermis while compacting the horny layers. It is a nourishing oil, formulated to improve the elasticity of the skin, reduce stretch marks and other body scars and tighten lax body skin. It has particularly good results when used in conjunction with AVST Hydrating Lotion. Environ AVST Hydrating Lotion is a neutralised lactic acid based body lotion containing medium levels of Alpha Hydroxy Acids (AHA’s) that are safe, gentle and non-toxic. The pH has been carefully adjusted to give optimal safety with the greatest efficacy. It assists the natural exfoliating function, leading to a clearer skin with greater resilience and a finer texture. The lotion replenishes the skin’s natural acidity helping to prevent a build up of bacteria, which can cause blemishes. It helps to safely and effectively soften and smooth the body skin while improving moisture content. AVST Hydrating Lotion is delicately fragranced with Bitter Orange. It is excellent for dry, rough skin on the body including feet, elbows and knees. It is particularly effective for treating excessive sun damage on the body when used in conjunction with the AVST Vitamin A, C & E Body Oil. It does not contain a sunscreen and should be used together with a sunscreen of SPF 15 or higher.